Something special happened near Donington last weekend. Those who experienced the 2011 Off The Tracks Summer Festival will never forget it. They won’t need to read this, or any other review, to remind them of a couple of days in time where everything was just ‘right’ …. They will instinctively feel it in their very bones. For those of you yet to discover OTT, read on. In an industry overloaded with cliché’s, OTT is, actually, one of the most precious, intimate, creative, and friendly festivals FFA has ever had the pleasure to review; populated by one of the most diverse and musically knowledgeable crowds around – it’s like a blisteringly good weekend long house party. The organisers work with a passion to keep it that way. After twenty three years they know exactly what makes OTT such a great event and control the size and scale accordingly. Big is Too Big. Rather than compromise the essence of what makes OTT so very special and unique, they elected to hold two events per year. Both the Spring and Summer events each have their own design and angle to keep everything fresh whilst managing to maintain that very, very, special OTT vibe. Once discovered, most festival goers naturally attend both events year on year. So these very nice people at OTT give you, dear festival goer, two opportunities a year to become your own little piece of a truly magical jigsaw. The perfect backdrop is in place already; based around a permanent campsite, with first class facilities, a real pub and diner on-site, and utilising the old farm and outbuildings to maximum effect, the OTT Summer event’s main marquee completes an intimate setup which is largely ‘weather proof’. Throw in a real ale festival of 60+ ales, beers, and ciders, running parallel to the pub bar; some really imaginative activities and workshops to keep the kids happy; impromptu entertainment in the courtyard; and the consistent ability to pick a line-up of such stunning quality and variety at all levels of the bill, and you begin to see the potential for something wonderful to happen here. All the organisers ask is that you leave your musical prejudices at the gate. So you’ll likely to find the same smiling faces who were captivated by Coda’s renditions of 13th century Cantigas, bouncing to bluesy rock, absorbed by the most beautiful of English & Celtic acoustic folk, whooping it up to Asian drum, and jigging to everything from jazz rock to folk house. Maybe it’s the brilliant crowd, maybe it’s the quality of artistic talent reflected throughout the entire line-up, maybe it’s the sheer genius of artist selection and scheduling, it all works. It all comes together. The OTT vibe kicks in. For instance, very late Saturday night all the threads were already there; you found Friday’s main stage headline act playing a surprise acoustic set around one of the tables inside the bar, a silent disco streaming an inspired combo of wicked cheese and big beats in the barn, the Frozac crew pumping some great psy trance to a bouncing second stage, whilst fire dancers and drummers were fascinating a chilled crowd in the courtyard. Then, as if all the planets had just aligned, out in the courtyard some punter struck up a sax! Simple in itself, but the final element to complete The Perfect Vibe. One of life’s little moments in time that you never forget. Friday night saw The Selecter bring their own highly influential brand of ska and 2 Tone to the party. Fronted by the iconic Mr Neol Davies and new frontman John Gibbons, the ten piece band kicked up a storm to get the festival really buzzing. ‘3 Minute Hero’ and ‘On My Radio’ were the highlights for FFA, plus some new material showcasing that these guys can still cut the mustard. Then straight in to the Peatbog Faeries to close the main stage. Absolutely splendid. Based on the Isle Of Skye, those long dark nights have allowed time for the guys to develop a totally unique musical style. With a undercurrent of traditional Celtic folk overlaid with house beats (or ‘croft’ beats, as the band are wont to say) amongst many other influences, Friday’s set was almost psychedelically spaced in parts, with the ever present ‘Folk Police’ as always, getting the crowd dancing as one. A chest mounted steel washboard driven set (yes, really) by Lil Jim’s Big Squeeze provided a fine end to barn stage activities. Saturday. Where to start? Old stager John Otway brought his madcap and extremely funny show to the early afternoon crowd. A highlight at any festival, Otway was again totally barmy as the guy celebrating in the pathos of the one man failure against the world. The baby prop during ‘Headbutt’s’ brought the house down. Excellent stuff. Martin Carthy & Dave Swarbrick, two of the Grand Masters of folk music, provided a thoughtful, quality set of traditional folk as pure as the driven snow. Laced with Carthy’s self-effacing humour and some wonderful fiddle playing by Swarbrick, it was an honour to see these two stalwarts of the folk scene together again. Next up - Merry Hell, what can we say? A superb set of good time folk rock and powerful lyrics from a band originating from the sadly missed Tansads. The three Kettle brothers are back at the core with other ex-Tansads in abundance to take their music to new heights and directions. The crowd loved them. FFA loved them. Nuff said. A perfect scheduling foil to counterpoint the excellent traditional folk of Carthy & Swarbrick. Very clever. Over on the second stage FFA caught JP Cooper; a voice and songs so beautifully fragile it took our breathe away. With lyrics and melodies seemingly weaved from mist, this artist epitomised the OTT claim that you’re likely to come away from the festival having discovered a favourite artist that you previously did not even know existed. This is a young singer songwriter of immense talent. You heard it here first. Not many festivals can seamlessly throw in an act playing 13th century Cantigas to great effect but Coda delivered it with apomb. Did we dance – sure as hell we did. Along with JP Cooper, King Capisce were the other previously unknown highlight for FFA. Playing some absolutely stunning arrangements of jazz fuelled rock, these guys were reminiscent of some of the great British jazz rock outfits of yesteryear like Soft Machine and IF. Praise indeed. Interweaving complex jazz phasing with driving rock this was a brilliant set. Another one of the many bands destined for greater things that the audience will recall in future as seeing first at OTT. 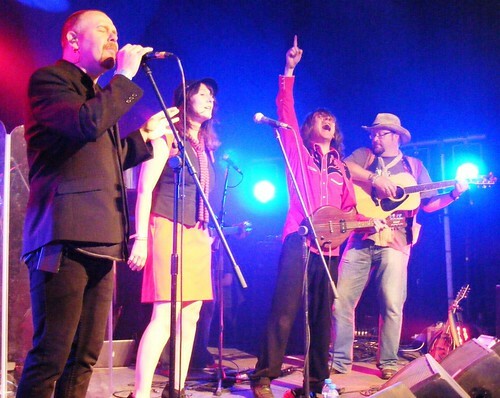 On the main stage rapidly rising stars Saint Jude delivered their inimitable style of bluesy rock. They had the place jumping. Jackaman had the crowd in the palm of her hand as she delivered songs from the recent Diary Of A Soul Fiend album plus newer material. Great to see a British act grab the mainstream blues-soul based rock scene by the throat. On this performance the Saint Jude phenomena can only grow and grow. In a scheduling masterstroke, Saturday headliners The Dohl Foundation took the stage. A drum act to close the main stage? – no way! But this is no ordinary festival and The Dohl’s are no ordinary band. Jonny Kalsi marshalled the guys to provide a visually stunning and musically superb performance. Drawing on his experience with the Afra Celts amongst many others, Kalsi orchestrated a hugely entertaining and varied set with the band’s bhangra beats in particular getting the enthusiastic crowd bouncing. Long time favourites of FFA, the Dohl’s just get better and better live. Splendid stuff. Sunday provides more of a chilling out, mellow day; particular highlights were Tri, a trio of young musicians of absolutely immense talent playing masterful arrangements of traditional English and Celtic folk. With musical maturity well beyond their years, Tri appear to be yet another band destined for greatness who you’ll recall seeing first at OTT. The comic genius of Lancashire Hotpots was something to behold. Rounding up every North of England cliché possible behind the Co-op and beating them with sticks into a grotesquely funny caricature of ‘northern life’, the band let rip with all the classics, including great versions of ‘Chippy Tea’ and ‘He’s Turned Emo’. Sorted our kid. So there you have it - OTT is so bloody brilliant it even made this reviewer forget he had man-flu … an achievement and accolade by any measure. Off The Tracks Spring Festival 2012 is scheduled for 25th - 27th May 2012 nr Donington, Derbyshire. Full details will be here when available.